For the specialist: Three types exists of these stamps. 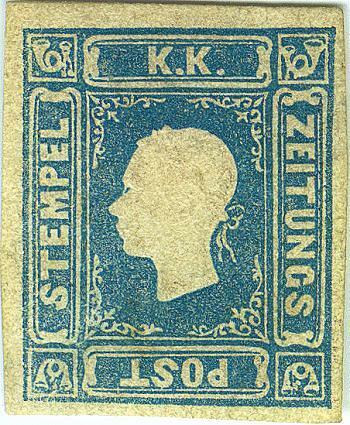 The blue stamp was printed in all three types. The yellow and red stamp were printed only in type I. The orange stamp was printed in type III only. In type I the 'G' of 'ZEITUNGS' has no crossbar and the dots on 'A' of 'STAMPEL' are evenly placed on the 'A'. In type II the 'G' also has no crossbar, but the right dot on the 'A' is placed sligthly more to the left, so the two dots are closer together.In the last type, type III, the 'G' has a crossbar and the 'A' is as in type II. Most of these stamps are rare, since they were thrown away, together with the newspapers. The forgery below is probably a Spiro forgery. The front of the tunic starts at the 'T' of 'STAMPEL'. In the genuine stamps, the front of the tunic starts before the 'S'. There is a '.' 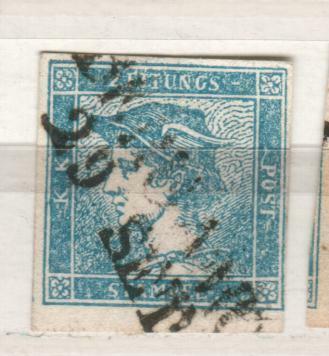 instead of a '-' after 'ZEITUNGS' (this is not visible in the stamp below, however). (information taken from 'the Spud Papers'). I have only seen these forgeries with the cancel dots in a square as shown below or uncancelled. Fournier also sold these Spiro forgeries (second choice as he offered them), he offered the four values for 1 Swiss franc (in his 1914 price list). The background and corner ornaments are quite different in the above forgeries. 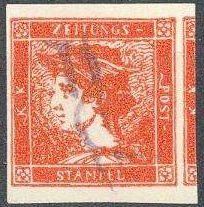 I posess Winter forgeries of all 4 stamps, the yellow stamp has cancel 'STEYR 17/11' in a single circle, the red one 'PESTH 5/3' in a rectangle and the orange one a double-circled postmark 'ZEITUNGS EXPED. LAIBAICH 12/12'. As can be seen above the 'PESTH 5/3' cancel was also applied on the yellow stamp. Also can be found: 'ZEITUNGS EXPED. WIEN 20/11' and ' WIEN 3/3 6 A'. These forgeries were even offered on pieces of newspaper, but also uncancelled. Reprints also exist (see http://www.kitzbuhel.demon.co.uk/austamps/reprints/ for more information). 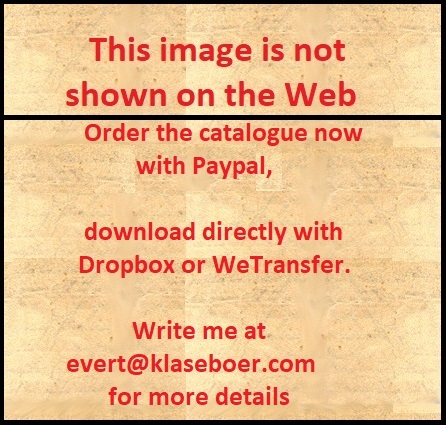 The above reprints were made by Ernst Fellner (in 1885?). I don't think these reprints are very common.